Sign up for Broadjam today to follow Carl Gustave, and be notified when they upload new stuff or update their news! Carl Gustave is a singer , songwriter, guitarist , producer . His musical style is a melting pot of blues, jazz , reggae ,rock and soul. When watching Gustave perform ,audiances from around the world have been witness to an artist delivering his set with conviction and raw emotion . 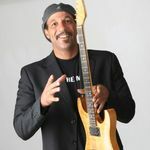 Gustave began his musical journey in Los Angeles ,California where after high school he began performing his original music in clubs on the Hollywood strip and other venues around town. After his band split he began performing with other artists from the area both live and in the studio.